MET-Rx Super Joint Guard is a combination of the most powerful joint health ingredients with omega-3 fatty acids, and it is aimed at athletes and heavy lifters. The composition in each soft gel is based on the effects of GLUCOSAMINE, CHONDROITIN and MSM, which are, indeed, the three top ingredients to be included in any product advertised as promoting healthy joint function. It is well known that athletes are putting a lot of pressure on their joints, and, in time, problems can appear, just like people with sedentary lifestyles experience, but for the exactly opposite reasons. 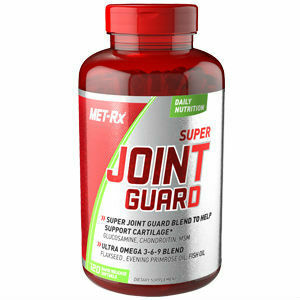 From the list of ingredients, MET-Rx Super Joint Guard sounds like a powerful, dependable product worth taking as a supplement by athletes and people who lift heavy weights. Read on to find out more. What Does MET-Rx Super Joint Guard Contain? Be aware that the product also contains soy, fish and shellfish, so if you are among those with allergies, you should consult your doctor about taking such a supplement. We are glad to see that so many powerful ingredients are included in this formula, although it is a downside that the product does not have HYALURONIC acid, as well. The recommended dosage for MET-Rx Super Joint Guard is four soft gels every day, taken with meals. The price tag for a bottle with 120 soft gels, or one month supply, is 27.99USD. The manufacturer offers a 90 days money back guarantee, from the date of the purchase, in case you are dissatisfied with the product. It looks like MET-Rx Super Joint Guard contains all the needed ingredients for a great product for JOINT SUPPORT. Glucosamine, chondroitin and MSM are the three key compounds, present in this formula. The rest of the ingredients, contribute as well, although we noticed that there is no hyaluronic acid included, much needed to improve the quality of the synovial liquid present in the cartilage. Also, more herbal remedies would have been welcome. Mark Stevens	reviewed MET-Rx Super Joint Guard	on May 14th	 and gave it a rating of 3.